Digital signage, specifically digital out-of-home (DOOH) media, is changing the advertising world. DOOH media thrives on three equally important aspects: technology, relevant content and audience engagement. The common denominator here is social media. Just as DOOH is changing advertising, social media is changing DOOH. Businesses are turning to social media in droves to reach their customers and find new ones. When social media is done right, offering a unique and rich experience, customers respond favorably. The proliferation of smartphones and apps keep all of us connected like never before. Marketers are turned to DOOH to leverage this trend to advertise in unique, often visually stunning and engaging ways, making it one of the fastest-growing advertising media in the world. According to PQ Media's new global forecast, “Global, Region and Market Spending, Trends & Analysis,” the global DOOH industry enjoyed double-digit growth in 2011. PQ Media is a leading provider of global media econometrics and pioneer of emerging media research. The report attributes the growth to the industry expanding into new venues and markets and providing enhanced features, such as mobile and social media tie-ins. The report states the total worldwide DOOH revenues increased 15.3 percent to $6.97 billion in 2011, driven primarily by the Asia-Pacific region. The study found this region to be the largest and fastest growing of the four major regions included in the study: Americas, Europe, Asia-Pacific, Middle East and Africa. Global DOOH revenues surged 25.3 percent. 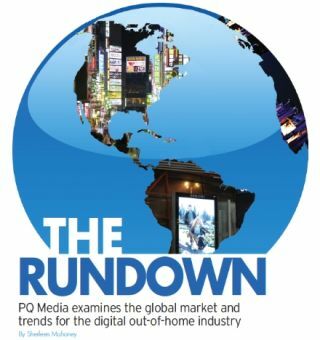 According to Patrick Quinn, CEO of PQ Media, the economies of many markets in the Asia-Pacific region, particularly China and India, have helped to bolster growth of the overall ad market. This has enabled emerging media, like DOOH, to post the strongest growth rates worldwide. Many of the largest public companies specific to DOOH, such as Focus Media in China, are located in this region, with substantial deployments and planned rollouts that are helping to spur growth. Quinn also says the gains in markets, lead by China, India and Malaysia, are helping to compensate for the weaker growth rates of developed countries in the region, such as Japan and South Korea. And interestingly, the euro crisis is only affecting those countries that have significant trade with European countries, such as Australia. The Asia-Pacific markets are only minimally affected. The United States is the largest DOOH market among the 28 countries tracked for the report, with $2.05 billion in revenues in 2011. China ranked second with $1.44 billion in revenues, followed by Japan with $759 million. Although the United States has the largest DOOH market, total revenues represent less than 30 percent of the overall OOH market. This suggests that the Chinese traditional out-of-home market was not as fully developed as in the United States when digital signage and screens were rolled out. As a result, the deployments in the Chinese market are more aggressive in locations not served previously by any out-of-home technology. Thailand's DOOH market represents nearly 50 percent of Thailand's OOH market, the highest percentage among the 28 countries ranked. Brazil follows with 33 percent. Many savvy DOOH operators in the United States are proactively seeking to incorporate social media into their signage to reach consumers across channels and integrating those platforms, for example, working with companies such as Locamoda or Insteo. However, PQ Media also found that operators in other large markets have yet to align with technology companies that provide the integration. This year, DOOH should continue to experience acceleration in growth, driven in part by the 2012 Summer Olympics. The European market, specifically the United Kingdom, should be the major beneficiary. The always-connected audience will expect to receive real-time event and score updates from the games, which will help drive spending in other markets. Global DOOH revenues are expected to exceed $6 billion in 2012. Metrics is by far the industry’s biggest challenge. Therefore, expect to see cutting-edge measurement technologies, such as eye-dwell technology, and facial recognition technology, along with new mobile and social media engagement, to be major components in future DOOH deployments. According to Quinn, other DOOH challenges include becoming a more integral part of the marketing mix. “This is not just a ‘nice to have’, but a must-have medium because of its ability to target,” he said. Providing brands and agencies with more abilities to purchase multiple operators simultaneously, either to have a national footprint or to reach specific demographics throughout the day, is incredibly valuable. Each market has its own unique characteristics, and expansions into new venues depend on local operators. For example, in the United States, roadside billboards will continue to drive industry growth. However, in other countries, there are roadblocks due to regulations. Some city governments, such as in Brazil and Germany, are clamping down on roadside clutter and limiting billboards on major highways. In another example, the United States is seeing DOOH growth in gas stations, but this is not the case in Europe, because consumers don’t pay at the pump. In Europe, Amscreen has found success with its BP network in the United Kingdom, which is leading to expansion in other countries in which BP has a major presence. Amscreen installed close proximity-signage units in BP's 335 company-owned sites and offered the technology to BP's 800 dealer partners. The screens display information, such as live traffic updates and advertising for BP products and services. In addition, the national and regional advertisers purchased ads to reach the 7 million motorists who use BP forecourts in the United Kingdom each week. JCDecaux, one of the world's leading outdoor advertising companies, has rolled out digital signage at bus shelters in Paris to make the city easier to navigate and more accessible for the public. Digital screens display news, local classified ads and wayfinding information, and list things to do in the neighborhood. Other general markets experiencing growth are airports and retail. PQ Media surveyed more than 300 U.S. digital place-based network operators, running more than 600 ad-based networks, and nearly 1,000 operators globally.